Okay, so it may not be Thanksgiving just yet but I'll be on the road this weekend and won't have time for an update. So be sure to eat plenty of turkey & dressing but most importantly, be SAFE! The holiday roads can be very dangerous so be careful out there! This has been your JPToys.com safety briefing for the year. Have you had a chance to check out the latest & greatest custom from Big Razzie? It's a custom Visitor's Center Playset built to scale to fit all of your JP toys! Razzie put a lot of time and effort into this custom and the results speak for themselves. She's recently opened a new site dedicated to the playset which can be found here. 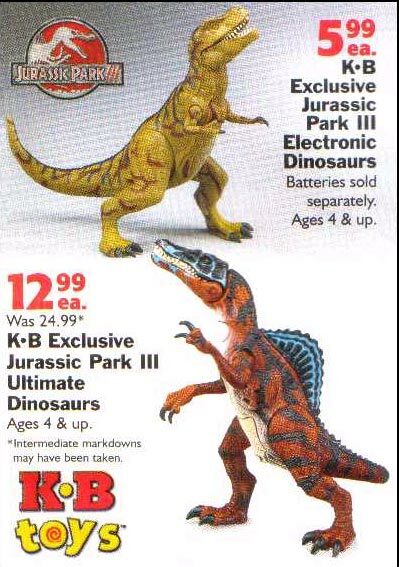 "In the little sections, it advertises the Ultra T-Rex and the CamoXtreme Jungle Spinosaurus! Good news some JP Stuff is in the light again! And as a KB Toys Exclusive!" Good news indeed. We hope everyone has a chance to cash in on these great sale prices while they last! If you'd like to view the entire ad, you can do so by clicking here. It's come to our attention lately that quite a few (if not all) AOL users are getting a message stating they've been banned when trying to log onto our forum. Rest assured this is not the case. We have a 3 strike rule at our forum so you should definitely know if you've been legitimately banned or not. Fortunately for those that are getting the message, we have found a way around it...for now. We've been asking those that are still receiving the banned message to try using another internet browser such as Internet Explorer. This seems to be working for everyone so far. We're not sure who's to blame here (AOL or Proboards) but at least those of you getting the message will still have a way to log in until we find out exactly what's causing this. We appreciate your patience. In other site news, we have a new collection gallery from Joe and a new review of the JP3 Raptor Attack Playset which are now both up for your viewing pleasure.